The Japanese word Kaden means Family secret. This Baieido "Old Family Secret" is the same formula as Kobunboku, but with the addition of Tsukigase Vietnamese aloeswood. This is an incense to be cherished during times of meditation, deep reflection and relaxation. Ingredients: Sandalwood, Vietnamese aloeswood, cassia, borneol camphor and traditional Chinese herbs. 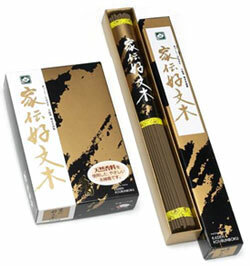 Wonderful incense, has a warm soft smell that lingers long after the incense is gone. Quite relaxing scent, very nice!